The week before, worse if I am under stress. As far as I know the warm air could increase circulation to your face, but could also dry it out some. If it feels drier just put on some extra moisturizer. If you have time I would be interested to know if your books say citric acid (other than being a pH adjuster) is just a food preservative, or can it also be a cosmetic preservative? I am reading a lot of conflicting information about this. Thanks! 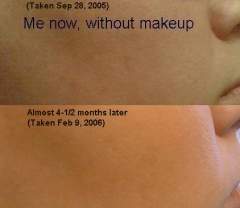 It looks like there could be something irritating your skin. If you can let us know everything that comes in contact with your face maybe we can help you better. Also if you let us know what country/state you are in someone can recommend products you can get locally. I use the cleanser from Magick Botanicals, it really is not an acne cleanser, it is more geared towards people with chemical sensitivities. 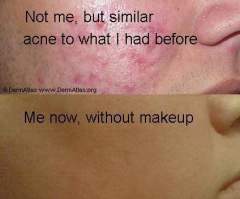 I don't have an acne problem anymore, but I suppose it could come back if I used the wrong products. sugar? or baking soda scrub? yes, i tried the aspirin mask before. left it on for 10 min. i tried to scrub uber gently. but it's soooo harsh, the particles are too big and abrasive. so i just washed it off. but the mask still irritated and dried out my skin BAD!!! is baking soda similar to aspirin in terms of harshness? if it is, it's probably not ok with my sensitive skin. Sorry to hear that happened to you with the aspirin. I have to give it extra time and water to dissolve or as you say the particles are too big. I tried baking soda once, it worked ok, but uncoated aspirin dissolved into a paste with water works a lot better for me. I have to be really gentle because it is easy to make my face temporarily red if I scrub too harsh.